Back to Venus on the "Homefleet Ships starting with V" page. Roger W. Jordan collection. Note that this is a post war picture of the ship, after she had been rebuilt. Delivered in May-1931 from Helsingörs Jernskibs- & Maskinbyggeri, Helsingör, Denmark (198) as passenger vessel Venus to Det Bergenske Dampskibsselskab, Bergen. Steel hull, 398.5 x 54.2 x 26.6, 5407 gt, 1760 tdwt, 2x 10cyl 4tev Burmeister & Wain totalling 9000bhp, 19.5 knots (the world's fastest passenger vessel at the time). In service Bergen-Stavanger-Newcastle together with the company's Jupiter (later with Vega, which replaced Jupiter in the route in May-1938). Captain was Vilhelm Dreyer. 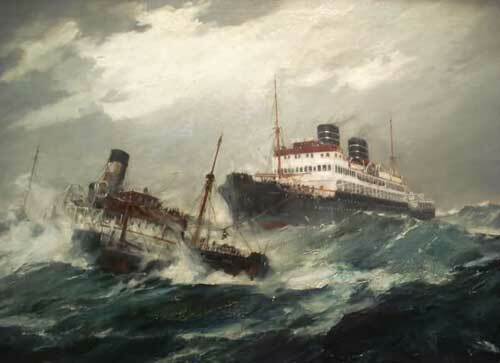 Late at night on Jan. 19-1937 Venus was en route to Newcastle in a storm when an SOS was heard from the cargo vessel Trym, which was en route from Kirkenes to Middlesbrough. Venus went to assist and remained standing by Trym, with the winds increasing to hurricane force. Early in the morning of the 21st Venus launched a lifeboat with 9 volunteers under the leadership of 2nd Mate Rolf Andreassen. In a spectacular rescue operation, in which Trym's Ordianry Seaman Perry Opsahl jumped into the wild seas with a line to the lifeboat, 6 of Trym's complement were rescued over to Venus. In a last effort to save the others, Captain Dreyer chose to maneuver Venus' bow close to Trym so that those still on board could get across. The success of this rescue operation became headlines in all of Europe's newspapers. In the same hurricane the company's Leda saved the crew from the cargo vessel Karmt of Haugesund, while Jupiter saved the crew from Weni of Stavanger, and Lyra saved the crew from the Swedish fishing vessel Nordland. Venus and Trym. Picture received from Jan Goedhart, Holland (painting by Frank Mason R.A.). Details on Trym rescue operation - Text is in Norwegian. The outbreak of war in Sept.-1939 caused BDS to take the valuable vessels out of the routes abroad, and instead used the less valuable ships, and Vega and Venus were laid up at Stanghelle in Osterfjorden (w/Stella Polaris), and were still there when Norway was invaded on Apr. 9-1940. Requisitioned by the Kriegsmarine, picked up from Osterfjorden and used in the Baltic under the German flag. Returned to owners on Oct. 16-1940, but requisitioned again on May 8-1941, rebuilt at Neptunwerft, Rostock, Germany, interior removed. Used as target vessel for the 26th U-boot Flotille, Pillau. Bombed and sunk in shallow waters by allied aircraft at Hamburg on March 20-1945. Returned to owners in May-1945. Raised, repaired and rebuilt at Helsingörs Jernskibs & Maskinbyggeri, Helsingör, having arrived there in tow on Sept. 29-1945, 6269 gt, 1760tdwt. 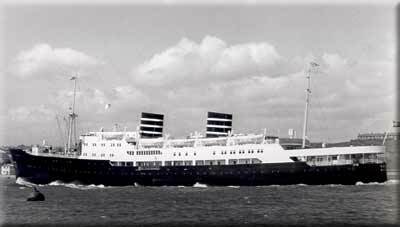 Resumed her original North Sea service from May 12-1948 with accommodation for 425 passengers. Also made winter cruises to Madeira and Tenerife. Withdrawn from service in Oct.-1968 and sold to Shipbreaking Industries Ltd., Faslane, arriving Faslane on Oct. 19-1968. Picture of Venus - Said to have been taken after having run aground off Plymouth on March 24-1955 (no further details available). (Misc. sources, incl. E-mails from R. W. Jordan, "Bergenske - byen og selskapet", Dag Bakka Jr., and info received from T. Eriksen, Norway - His sources: Articles about BDS in "Skipet", 1-2.88 by Dag Bakka jr., "Norges eldste Linjerederi, BDS 1851-1951", Wilhelm Keilhau, "Full storm", Trygve Nordanger 1973). Other ships by this name: Norway had lost a steamer named Venus to WW I. This ship had originally been delivered in 1872 as Serantes for Johnson & Co., Newcastle, 715 gt. Sailed as Sif from 1889 for Jacob R. Olsen, Bergen before being purchased by B. Stolt-Nielsen, Haugesund in Oct.-1898. Sold to E. B. Aaby, Drammen in March-1906 and renamed Venus. Struck a mine on Apr. 14-1917 (laid by the German submarine UC 50), 5 n. miles off Berwick on a voyage Blyth-Drammen with coal, still with the name Venus but belonging to owners in Christiania. ("Våre gamle skip"). Bjørn Milde, Norway has also informed me of another Venus, launched in Aug.- 1890 for unknown owners, 1095 gt, 775 tdw, purchased by Bergenske DS in 1892, in service to England until 1930 at which time she was renamed Sylvia. Sold to Brødrende Anda, Stavanger (breakers) in 1933. Further fate unknown. 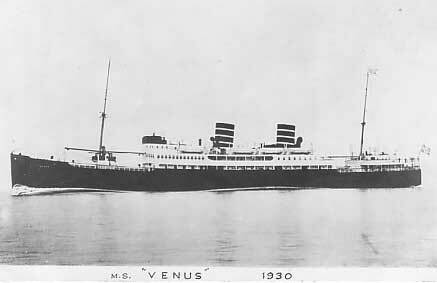 Denmark had a steamship named Venus (German control), struck a mine and sank of Schleimunde on Aug. 7-1941. Roger Jordan also lists a Dutch vessel by this name.